Can't believe it's taken me this long to post this little classic. Vaughn Bode was one of the great Underground cartoonists of the '60's and early '70's, his beautifully drawn, sexually explicit and mind-expanding comics causing a small revolution by bridging the gap between personal statement & commercial art in series like Erotica, Deadbone, Junkwaffel and his best known character, Cheech Wizard. ( All of which we'll be looking at as we go along ). 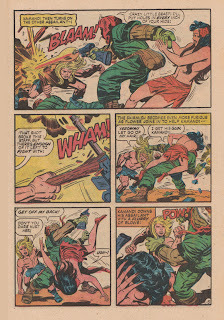 Bode's work is hugely influential, and much imitated, and not just in comics. The chunky, clunky style of graffiti art, and particularly of graffiti lettering, is directly traceable to his bright, unique style. But before he tuned in, turned on and became the legendary Cartoon Gooroo, he came up with this early masterpiece, The Man.
" 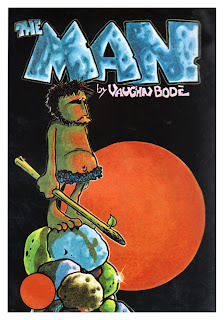 The Man by Vaughn Bode is very sad and very touching and full of the loneliness that must have been beast/man's long before we knew more of love and what it could do to save us from the uncaring universe, and, often, ourselves. " Just came across this on the net, and knew you'd all get as big a chuckle out of it as I did. 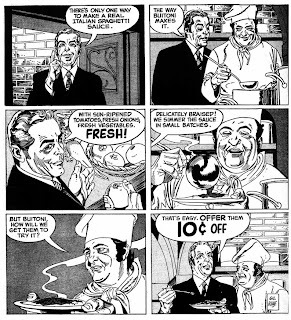 Yep, It's Gil Kane for Buitoni Italian Sauces! Recently, my old buddy ( and ex-Kid Of Rec. Rd ) David Holman was passing through Norwich, and natch, took the opportunity to go through my bookshelves like a pack of locusts. 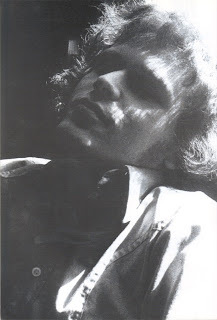 Dave is, as everybody who knows him is aware, a Marvelite through & through since birth. Which is, of course, a fine & splendid thing. However, this means that HE HAS NEVER READ, to pick a few titles at random, Manhunter, The Fourth World, The Spirit or Swamp Thing. Bearing this in mind, I made sure he didn't leave mine without taking, at the very least, these four books. So if you're reading this, Dave, here's why you should be reading my copy of Swampy! 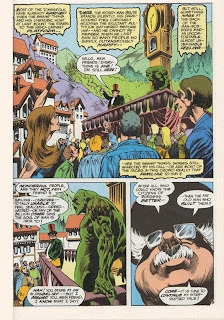 Swamp Thing was, of course, considered a classic comic long before Alan Moore rejigged it into the must read book of the '80's. 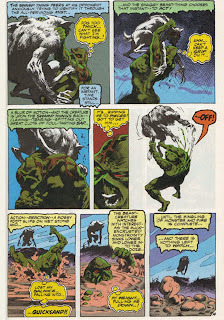 The original Swamp Thing series, the one that defined The Bronze Age as much as Manhunter, Green Lantern / Green Arrow or Tomb Of Dracula, had it's roots in a little 8 page strip that appeared in Joe Orlando's horror title House of Secrets. 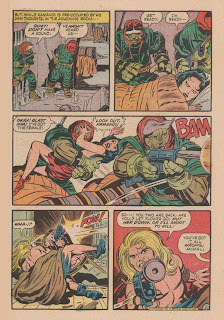 In the early '70's, Len Wein & Gerry Conway were rooming together, both having moderate success breaking into the business. 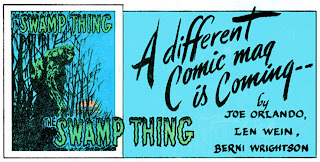 In a coincidence they've always sworn is true, both writers came up with an idea for a strip about a swamp monster at exactly the same time, and independently of each other. 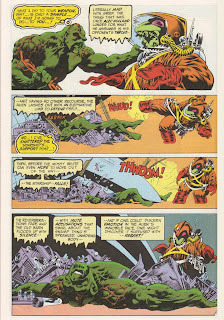 Gerry sold his creature, Man-Thing, to Marvel. Len's script, a victorian melodrama about a scientist murdered by a jealous rival, who comes back as a slime-dripping spectre, was placed to go into HOM, but it needed an artist. 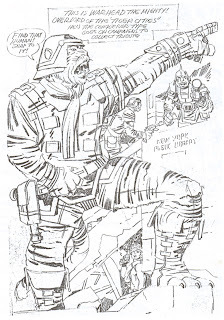 One weekend, so the story goes, Wein was at a party at lifelong buddy Marv Wolfman's house, when he & Berni Wrightson found themselves talking about the depressing state of their lives. 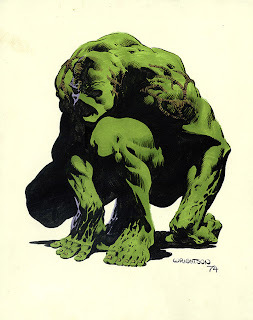 Wrightson had just suffered an acrimonious split from his girlfriend, and Wein suggested his gloomily romantic story as a method of catharsis. 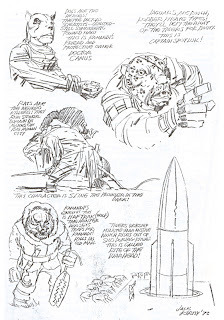 In order to get the piece done on time, Wrightson roped in all his friends to pose for photos: Mike Kaluta played the villain, Louise Jones ( later Simonson ) the heroine, Jeff Jones & Alan Weiss the supporting cast, while Wrightson himself bagged the role of the hero. 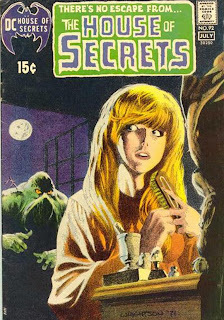 Swamp Thing appeared in House Of Secrets 92, and then everybody promptly forgot about it. Until the sales figures came in. HOM 92 was DC's best-selling book of that month. 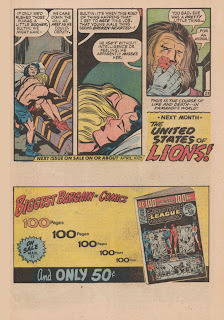 And when the fan mail started pouring in, Orlando & publisher Carmine Infantino immediately pressed Wein into thinking about a series. At first he refused, considering the tale too personal to be diluted by spinning it out. But after a year of cajoling, Wein realised he didn't have to stick to the original plot. 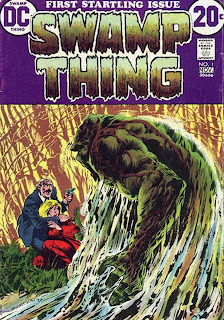 By using the title and the basic origin, Swamp Thing could be brought forward into the present day as a completely different character. 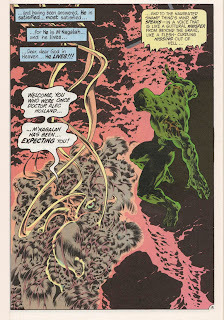 After persuading a skeptical Wrightson that it would work, the book was off and running. 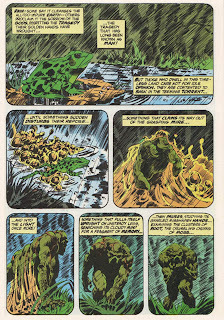 Swamp Thing is, of course, the story of Alec Holland, a scientist working on a serum to speed up the evolution & production of plant life. Secreted away in a lab in the swamp, Holland and his wife Linda's only link to the outside world is security agent Matt Cable. 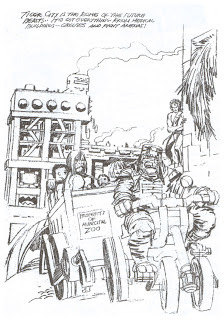 However, just like Man Thing's Ted Sallis, others are interested in Holland's formula, in this case, the mysterious Conclave. The Conclave send a couple of henchmen, led by an oily creep called Ferrett, to convince the good doctor to sell his secrets to them. Naturally, he refuses. Equally naturally, Ferrett sets up a bomb in the lab, which goes off, covering Alec in his bio-restorative serum, and sending him screaming into the swamp. After finding Linda dead at Ferrett's hand, the transformed Holland goes after The Conclave's henchman, and exacts his bloody revenge, but Matt Cable, having missed the whole thing, grabs the wrong end of the stick and assumes that this gruesome creature murdered his friends as well. The chase is very much on. 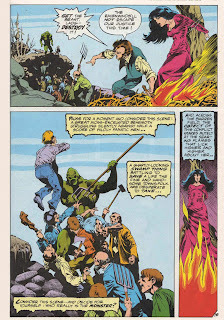 And finally, the return of Arcane & his Un-Men, along with a whole graveyard full of ghosts, in an episode that closes Wrightson's run nicely. 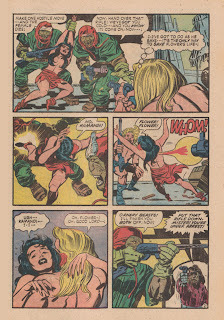 Wein's script's are wonderfully strange and odd, and you're clearly in a different world than the rest of the DC universe ( apart from that one notable exception ). He also handles the potentially cliched aspect of Holland's lost humanity extremely well, as you really do feel for the big green lug. 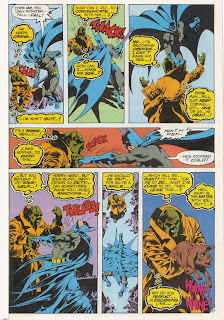 But what everybody remembers this series for, is of course Berni Wrightson's artwork. Berni had been regularly contributing one-off tales to House Of Secrets & House Of Mystery, but this is where he blossomed ( or should I say festered ) into a fan-favourite artist. 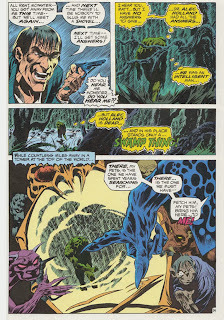 Every single character in Swamp Thing looks off-kilter and slightly deranged, even the good people like Abby & Cable. 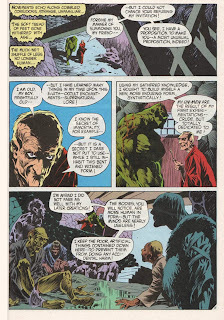 All except Swampy, who Wrightson infuses with a gentleness & intelligence that lets you know there's still a person under that muck-encrusted mockery of a man. And he really goes to town on the settings and the monsters. This is an artist unleashed, and enjoying every minute of it. Once again, you are clearly in another world, a darker, sicker one dripping in ichor & dread. 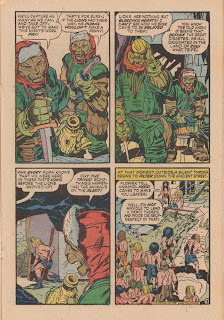 Worth mentioning also, is the superb lettering design by Gaspar Saladino, denoting Swampy's dialogue and narration in slime dripping borders. 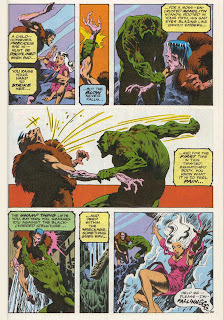 The team only lasted on Swamp Thing for ten issues, Wrightson complaining that it was turning into a 'monster of the month' book, and though that's certainly true, there's something primal going on here, plus the sub plots are enough to make it seem like one continuous story, with at least a partial ending. 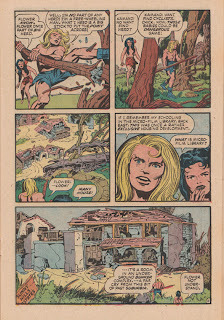 The book continued on for a while, of course, under the hands of greats like Nestor Redondo, until it was eventually revamped by Moore, but if you haven't read this, you really need to. 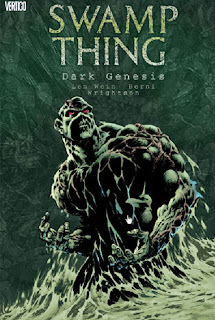 It's a true classic, and you can read it in Swamp Thing: Dark Genesis. When I was a kid, I didn't want to be Spider-Man, Batman or Superman. 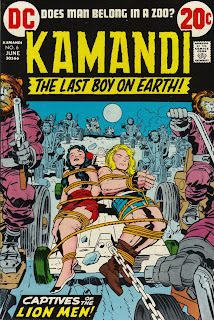 I wanted to be Kamandi. 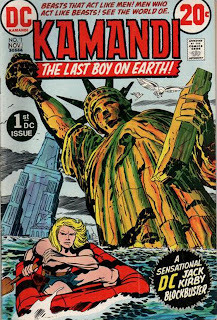 Kamandi was Jack Kirby's longest running book of his '70's stint at DC, and though it doesn't seem to be as highly thought of as The Fourth World, possibly lacking that series' depth & personal insight, it's still in a lot of people's favourite's list, including mine. 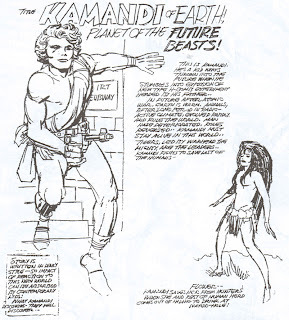 It sprang from a need to up Kirby's then dwindling page count, and the original idea came from Carmine Infantino, who'd been trying to get the rights to do a comic version of Planet Of The Apes ( he was beaten to it by Marvel, of course ). Refusing to admit defeat, Carmine went to Jack, and suggested he put something together like Apes, but not close enough to be libellious. 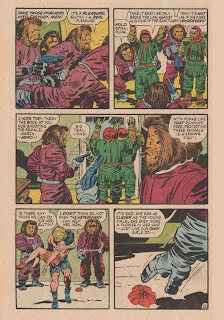 Kirby had, at this time, apparently not seen any of the Apes movies, but was certainly aware of the premise. 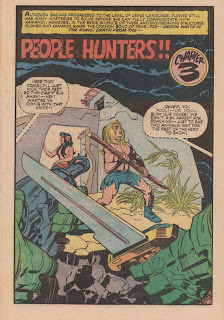 Digging around in the closet where he kept all his unsold, unused ideas, he came across some pencil samples for a newspaper strip he'd once tried called Kamandi Of The Caves, ( seen here courtesy of The Jack Kirby Collector ), and went to work. 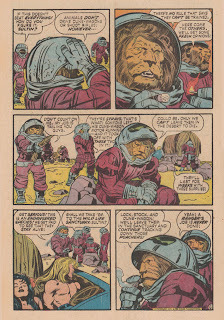 Typically for Kirby, Apes was barely a starting point for the gigantic, insane world he was about to create. Why stick with just monkeys, when you could have all animals becoming intelligent? Here ( again thanks to The Collector ) is some of Jack's original ideas for the strip, with a strangely Greek looking Last Boy On Earth. 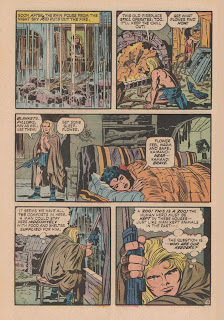 I first met Kamandi with this issue, no.6. This being the first one to reach Haverhill, distribution being as haphazard as it was in those days. And instantly I thought it was the greatest thing ever. As became obvious in future issues, this was a series where the sky was the limit. 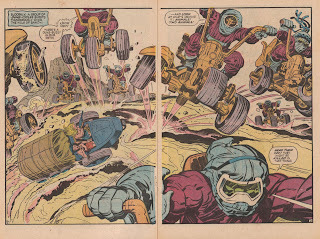 As opposed to the also excellent The Fourth World, whose titles were set solely (solely?) 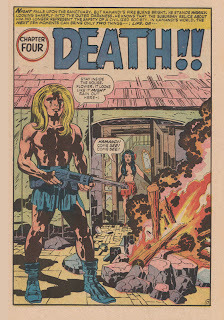 around one huge, galaxy spanning plot, Jack clearly sat down each month and simply thought: Where shall I send Kamandi to today? 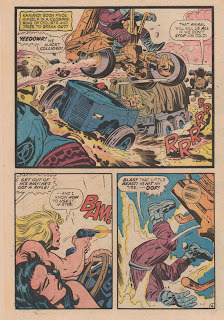 This issue might actually be my favourite Jack Kirby comic ever. Sure it's not deep, it's not trying to say anything, but it's so action-packed, so exciting, and so thrilling that you're exhausted by the last page. Plus the ending is heartbreaking. 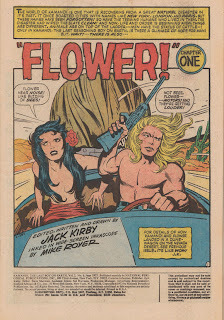 And by the way, anybody still doubting Kirby's genius, take note of the title. Every other writer would've called it: The Last Man On Earth. Jack knew his audience, and that's certainly what I responded to. 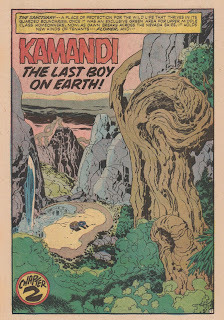 Jack started Kamandi without a great deal of interest in the premise, having been deeply crushed by the perceived failure of The Fourth World, his most personal saga. 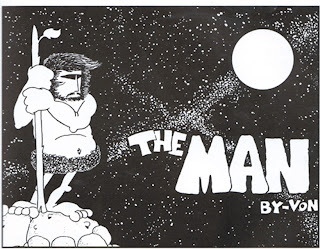 A story set in a post-apocalyptic world, and centered around death, was completely against his sensibilities, and he was determined that this book wouldn't revel in negativity: " This must be a comic about fighting to survive. " 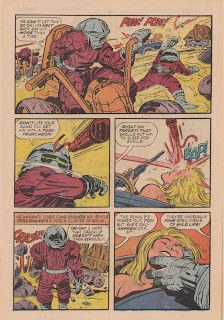 In The World That's Coming-We'll Need--OMAC!